Welcome To Americas Best Value Inn Atascadero / Paso Robles. We are located off of Highway 101 halfway between Los Angeles and San Francisco. Astascadero is minutes away from the Pacific Ocean and the stately Hearst Castle. The city is a haven for artistic culture- hiking- golfing- and some of the finest wineries in California. Start your day off right with our free continental breakfast and coffee in our lobby. Stay connected with free wireless high-speed Internet access in our guest rooms and common areas. Enjoy the privacy and comfort of your own guest room featuring amenities including a hairdryer- mini-fridge-42-inch flat screen HD TVs- cable TV with ESPN and HBO-all new pillow top plush mattresses-free local calls- and wake-up service. Sorry- no pets allowed. Visitors can start their day downtown at the beautiful Sunken Gardens Park and view the historic city hall building which was built in 1918. The rotunda building was named a California Historical Landmark in 1977. Architecture and history fans will also want to visit Hearst Castle which was built by newspaper magnate William Randolph Hearst and turned into a state park after it was donated to California in 1957. Book a tour with The Wine Line- where tourists are picked up at the hotel and shuttled to over 60 local wineries. Take a hike at the Bishop Peak Natural Area or the Jim Green Hiking Trail to enjoy the beauty of central California. Chalk Mountain golf course and the Hunter Ranch golf course offer some of the best designed courses in the state. There are also several restaurants close to the hotel that offer the finest in local cuisine like the Que Pasa Mexican Cafe- A-Town Diner and Deli- or the Colby Jack Cafe and Bakery. At Americas Best Value Inn Atascadero / Paso Robles- Weve Got You Covered from the time you hit the road until your head hits the pillow. Carl*s Jr. / Green Burrito: 0.2 mi. Thai Elephant Restaurant: 0.4 mi. Que Pasa Mexican Cafe: 0.2 mi. Colby Jack Cafe and Bakery: 0.6 mi. Round Table Pizza: 0.3 mi. A and W All-American Food: 0.03 mi. A-Town Diner and Deli: 0.4 mi. 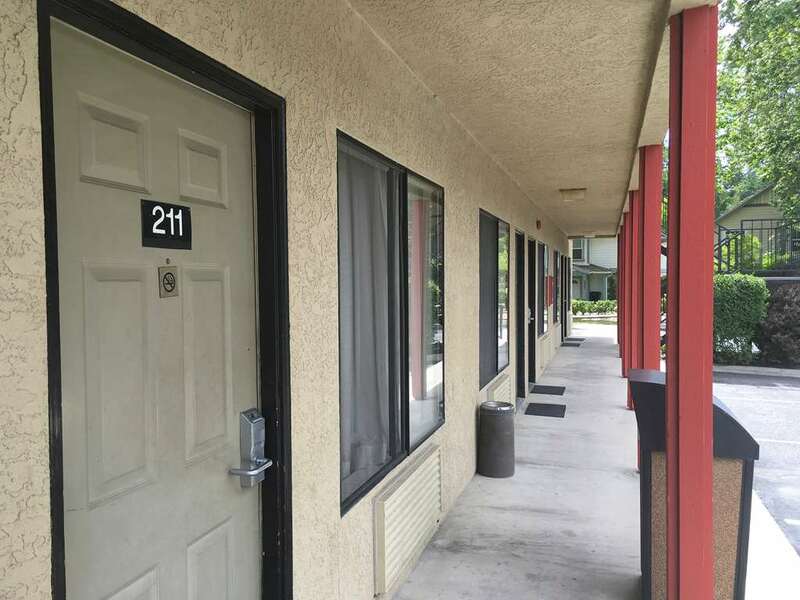 Welcome To Americas Best Value Inn Atascadero / Paso Robles. We are located off of Highway 101 halfway between Los Angeles and San Francisco. Astascadero is minutes away from some of Californias most beautiful beaches and home to several scenic hiking trails. Visitors can experience all of the best that California has to offer in Astascadero. Our address is 6040 Morro Road- Atascadero- CA 93422.